It feels like a natural thing to rub your eyes when they are itchy, watery, or otherwise irritated. Keeping your hands away from your eyes, however, is a smart choice for promoting better eye health. Rubbing your eyes can lead to everything from eye injuries to damaged vision. Rubbing your eyes offers only short-term relief at best, and isn't worth the problems it causes. How Can Rubbing My Eyes Cause Damage? Eyes can become itchy or irritated for multiple reasons. Sometimes, it is a reaction to pollen, dander or other allergens in the air. Other times, a foreign object can be the source of irritation when it becomes trapped inside your eyelid. In either case, rubbing your eyes can be dangerous. Your eyes have a natural defense mechanism for removing irritants. 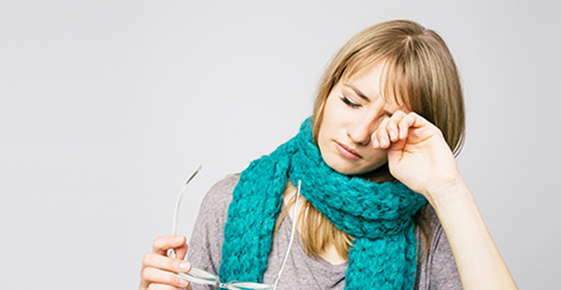 Tears are produced by your tear ducts and these work to flush irritants from your eyes. Eye drops can be used as a supplement to natural tears in a person who has dry eyes and does not get enough tear production to relieve irritation. Rubbing your eyes when a foreign object is trapped inside your eyelid can cause it to scratch your cornea. It will also increase irritation by releasing additional histamine into the affected eye and can potentially cause infections to develop. Dark circles may also appear over time if you frequently rub your eyes. Rubbing causes blood vessels in the eyelids to break and leak blood. The blood pools under the skin to create dark circles. Once dark circles appear, it can be difficult to get them to disappear. Wearing an eye mask when you sleep may be necessary to fully eliminate dark circles caused by rubbing. Consistent eye rubbing over an extended period can lead to a condition called Keratoconus. This condition causes a thinning of the cornea and results in the cornea losing its shape. Keratoconus can lead to blurry vision and sometimes cannot be fully corrected even with glasses or contact lenses. Severe infections can accompany keratoconus. Fingers often carry germs, even if you wash your hands regularly. Those germs can result in pink eye and other similar complications if you rub your eyes. Chronic eye rubbing opens the door to suffering long-term vision damage that cannot be fully corrected or reversed. National Keratoconus Foundation. "What Causes Keratoconus?" Web. 2014. Essilor USA. "Think Twice Before You Rub Your Eyes." Web. 2014.